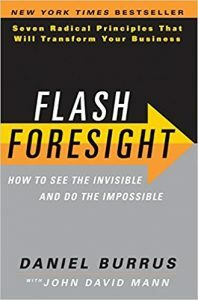 Foresight professional Daniel Burrus in his excellent book Flash Foresight (2011) divides probable futures into two useful general categories, hard trends and soft trends. Let’s look at each now. Hard trends are processes that seem very highly probable (90%+, a hard trend). He also discusses future events that are essentially certain (99 point something percent probable) and he calls those future facts. Our expected future facts are related to our past and present facts, by science. It is a future fact that the sun will rise tomorrow. So is the observation that we’ll each have less remaining lifetime tomorrow. So let’s make hay while the sun shines, as they say. We have a growing collection of distant future facts as well. Our universe will have no more stars, or life as we know it, in roughly 10 trillion years. Our sun will become a red giant in roughly five billion years. Earth will be uninhabitable for biological life in under a billion years. Again, let’s make sure we do something about that problem. We’ll offer one model for what we might do in Chapter 7. 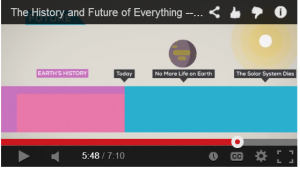 For a fun intro to some things history and science tells us about our past, and science tells us about our future, including the death of our sun and the universe, see Philipp Dettmer’s 7 minute infographic video, The History and Future of Everything, YouTube (2013). Hard trends are less absolute. They include observations like automation and machine intelligence will continue to accelerate, absent some global catastrophe. We’ll keep moving data and software to the cloud. Our smartphones will be able to listen in on and semantically understand our conversations in realtime within ten years, etc. That last one may well happen in five years, but 90% of people who have studied these things would agree it will happen commercially within ten years, as there are consumer use cases and we’re already seeing demo versions of this technology today. Since science and human knowledge are always partial, there will always be many more candidate hard trends than future facts. For our hard trends in particular, our probability estimates could at any time be made wrong by hidden assumptions, unexamined alternatives, unseen processes, incorrect models, and known or unknown uncertainties. So we need to be continually open to new data or events that might change our probabilities. But that should not stop us from collecting as many of these as we can. Every hard trend or predictable future we find allows us to better filter all the complexity and information in our world, and to stop wasting our limited time and energy exploring unlikely or impossible futures. Whenever we find a hard trend, we also may have found something that we can’t stop, even if we wanted to. In our evo devo language, it may be a developmental, not an evolutionary process. Not all hard trends are inevitable, but most certainly are. When you appreciate that inevitability, you can stop trying to stop the process, and instead start figuring out how to guide it in ways that best reflect your values, slowing down or closing off the bad paths, and speeding up or subsidizing the better paths toward that inevitable future. Soft trends also have a probability we can attach to them, but this probability is lower, and spans a much wider range, than for hard trends. It might be anywhere from 10% (large enough to be significant) to 89% (highly likely, and nearly a hard trend). Soft trends are processes or events where we say or expect “might” rather than “will” happen. Some of these soft trends are subject to social influence and intervention, but many, like astronomical or weather events, are obviously not. At what numerical probability our language or expectations change from “will” to “might” happen, for any trend or prediction will differ for different people. Timescales are important too. Some soft trends will become hard trends over time, as a complex system edges or “funnels” toward to some inevitable developmental transition. For example, the probability of India’s independence from Britain probably sees-sawed up and down erratically over the ninety years of the Indian independence movement. Yet at some point over that time period, as the average probability grew in people’s minds, it became a recognizable soft trend. Eventually, it became a hard trend some time in the 1940’s. It reached certainty (became a recognized future fact) at some point in 1947. Less frequently, hard trends become soft as well, as we find flaws in our models over time, or as reality contradicts our models. There’s a famous saying in foresight work “A trend is a trend till it ends, or bends.” Trends occasionally reverse themselves, or switch their states after certain events. A change in direction or intensity is a common occurrence in soft trends, and we often don’t know why. Trend changes occur in hard trends as well, sometimes converting them back to a soft trend, with less consensus on its future. But with hard trends in particular, there is often a set of processes and a model waiting for us to discover, that can help us convert the soft trend back into a hard trend. Let’s consider an example from computing technology, a topic we’ll discuss in Chapters 7 and 8. Many computer experts expect that rapid exponential improvement computer performance per dollar “will” continue as a hard trend over the next five years. We’ve seen computers get twice as powerful per dollar roughly every two years since the mid-1960s, and we know the physical reasons, based on transistor miniaturization, why it occurs. We call this hard trend Moore’s law, and it’s one of the cornerstones of our expectations for the computer industry. But our transistor-based Moore’s law has also been slowing since 2005, as we are now nearing the limits of transistor miniaturization in our current chip manufacturing paradigm. So if you ask experts for their probability that computer power will get half as expensive every two years for the next twenty years, rather than five, they’ll say that it “might” do so. Yet if we consider the physics and economics of computer design, as we’ll do in Chapter 7, we can observe that once transistor miniaturization stops, we have a new economic opportunity to move our chip designs into massively parallel (brain-like) neural network oriented chips, an opportunity that wasn’t practical before. As our transistor-based Moore’s law increasingly slows, a neural network-based Moore’s law now has the opportunity to continue the trend, in a new manufacturing paradigm, focused on miniaturizing and optimizing network ensembles and circuits, not transistors. The large majority of those who think those neural networks can do increasingly complex kinds of computing, including the leaders of a computer science field called deep machine learning, would today bet that this neural network version of Moore’s law “will” continue on as a hard trend. 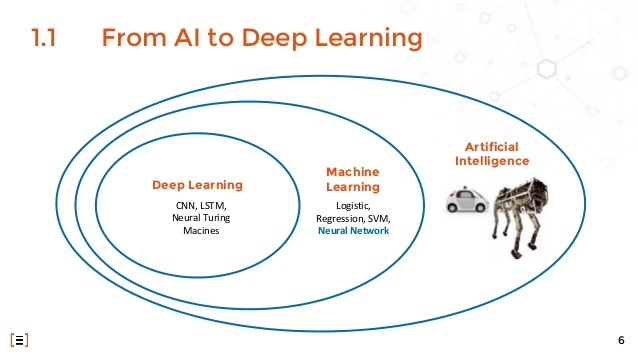 In this view, neural network-type deep learning methods will increasingly take over the fields of artificial intelligence and machine learning, from which they emerged (picture right). That view is not yet shared by the majority of the computing community, but as I argue in Chapter 7, I believe it eventually will be, as deep learning machines are able to increasingly do unsupervised and lightly supervised learning, and as they accomplish increasingly amazing feats of intelligence in coming years. This presently unrecognized hard trend, in fact, is the most important single social and technical trend we will discuss in the Guide. For a few more examples of both types of trends, most climate experts would agree that global average temperatures “will” rise at least a bit over present day temperatures over the next few decades. Yet many experts think they “might” rise as catastrophically as six degrees in the next hundred years, as Mark Lynas explains in Six Degrees (2008). The long term nature of our growing climate instability is a lot harder to predict than the simple claim that average temperatures will continue their current rise as we dump ever more greenhouse gases into our atmosphere. Socially, our average living conditions “might” continue to become measurably safer and less violent, on average, just as they have over the last twenty millennia, according Stephen Pinker, Better Angels of Our Nature, (2010). We might even be able to predict, with with good models, that they “will” become measurably safer and less violent, under the right circumstances. Unfortunately, we don’t yet have good causal models for why violence has declined as dramatically and near-continously as it has, in the last few millennia, centuries, and decades (we see it at all scales). But we have some hypotheses that need to be tested, and Pinker explores a number of them in his masterful book. Using good data and experiment to refine the probabilities of our hard and soft trends requires an evidence-based practice. We can do this for our history as well as for our present. The emerging discipline of cliometrics, for which Robert Fogel and Douglass North received a Nobel prize in 1993, is the probabilistic and predictive study of economic history, using statistical methods and economic theories, and new methods of historical research. It is one way our history gets more predictive, and it helps us to find more hard and soft economic and societal trends. As Burrus says, all good foresight work should “Start with certainty.” As we begin our learning in any problem domain, the first step is to consider any general science, past, present and future facts, hard trends, and constraints that seem relevant to our problem. Once we have found a good number of those in the literature, we have earned the right to think more clearly about what might happen (soft trends), and what we want to do (visions, goals, strategies, plans, actions).